This presentation gives you insight and awareness related to the crisis of identity and resource theft by hackers and miscreants that use our open systems and culture against us everyday. They are using more and more stealthy means to compromise systems and do more harm that we’ve ever imagined. This is a great opportunity to understand the economies and infrastructure that exist for these “badguys” and to turn the information they steal into cash. You’ll see example after example of cases where the misuse of systems and information turns into money for people usually thousands of miles away. You no longer need a gun to rob a bank, nor do you even need to be in the same country to steal from a bank or an individual. 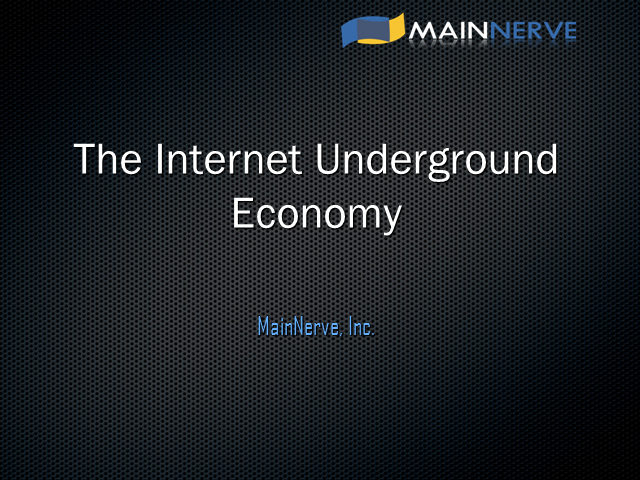 Ian Dawson, Director of Security Operations, MainNerve, Inc. Presented by: Ian Dawson, Director of Security Operations, MainNerve, Inc.